If you haven’t read about ad blocking in the recent past, I envy you. For those of you who did escape the bonanza, please share the location of the rock you were living under. Ad blocking gives Internet users the ability to remove all ads shown on any web page. The product is typically run in a browser through an extension, though some advanced versions exist, like Shine. The main providers are AdBlock and AdblockPlus, and according to PageFair, a whopping 200 million people worldwide use ad blockers when surfing the web. It’s undeniable that ad blocking creates a better Internet experience. Nice clean pages, no flashing ads, or, God forbid, pop-ups. The difference is even more noticeable on your smartphone: faster load times and less of your already-tiny screen wasted on ads. At the same time, however, ad-blocking takes away the main source of revenue for content creators – advertising is their livelihood and the reason why we get to enjoy most of the web for free today. Blocking ads has actually been popular in Europe for a while. According to the same PageFair study, more than one third of Greek Internet users run ad blockers. Ad blockers are really only now gaining steam in the US, with an estimated 10% penetration. The most recent debate was fueled by Apple’s decision to support (3rd party) ad blockers in the Safari browser with the release of iOS9. Phrased differently, while ad-blocking was previously mostly a desktop affair, it is now supported by Apple, and with that, half of the worldwide mobile market. Furthermore, since a ton of ads are trafficked and sold through Google (e.g. Doubleclick), many believe that Apple’s endorsement is part of a larger goal to replace Google’s (blocked) ads with advertisements sold (by Apple) in the brand-new Apple News App. The fact that the News App was released alongside the support for ad blockers in iOS 9 only fueled this conspiracy theory. This line of thought was flawed from the beginning – Apple has given its users the ability to block ads in Safari FOR YEARS. Just press the “reader mode” button in the left corner of the address bar, and you get a squeaky clean reading experience. And there’s additional evidence suggesting that ad blockers in iOS9 are neither make nor break. According to eMarketer, mobile advertising in browsers ($8 billion) will only be a smallish portion of total mobile advertising dollars ($28.7 billion) in 2015. And as popular as the iPhone is, mobile Safari “only” commands a 24% market share (source: NetMarketShare). That also assumes all iPhone users switch (or can switch) to iOS9. And third, Apple only supports ad blockers; they don’t pre-install. iPhone users still need to download an app from iTunes, install, and activate it. So lo and behold, the support of adblockers in iOS9 looks like a tempest in a teacup. Generally speaking, nothing has changed (yet) in the content industry since the debate first started. If two things stood out, it was a confession by the publishing industry that today’s advertising experience stinks and consumers voicing that it is more than just ad-blocking. It’s about their online privacy. That’s why users (including me) have turned to tools like Ghostery. It’s a simple tool that reveals all the trackers and general 3rd party, non-content, baggage that comes with a site. It’s almost scary, with Evite being my personal topper: 72 trackers. Imagine 72 private investigators quietly following every single click or gesture you do. Clearly – that’s wrong. When Tim Cook announced ad-block support in iOS9, what he really meant was privacy support, further evidenced in this TechCrunch article (and besides, ad-blocking has been directly built into Safari for years). Nevertheless, quite a few companies came to the rescue of publishers, noticeably PageFair and Secret Media. Both companies focus on helping publishers, but each from a very different angle. PageFair swaps out the intrusive ads for more friendly ones (think: text). While this model has good intent, it’s hard to believe that these text ads yield the same amount of money or that there’s even enough available advertising dollars going around to make it worthwhile for the publishers. Secret Media, on the other hand, is a full-on assault on the ad blockers by trying to outwit them. Whilst pleasing a few hundred publishers, they deny what a billion Internet users want: no ads. Fighting the collective Internet with a handful of people is akin to trying to change a Wikipedia page and as such questionable over the longer term. The Internet has always been free. Past and recent attempts to make it paid have been largely unsuccessful i.e. only quality publications targeting specialized (or niche) audiences get away with it (e.g. The Economist, The Information, Pandora One for businesses, etc.). Publications that target a broader audience (e.g. New York Times) and/or run lower editorial standards (…) have found no serious traction. Publishers will need to charge, and to the extent that they otherwise deny access to ad-blocked visitors, consumers will pay (especially if it were to come with a broader promise of privacy, not just ad-free). There’s simply no incentive for publishers (i.e. ads monetize well enough) or readers (i.e. the web is free) to make it work on a larger scale. But with the proliferation of ad blockers, these incentives will manifest themselves: publishers will need to charge, and to the extent that they otherwise deny access to ad-blocked visitors, consumers will pay (especially if it were to come with a broader promise of privacy, not just ad-free). It is no stretch to see these incentives between publisher and consumer work in a virtuous circle with each other. More ad blockers means more content moving to paid (and privacy-guaranteed), and more consumers eventually paying. In short, ad blockers may very well be the externality that makes paid content a reality. Even micropayments for single articles is in reach. As Bitcoin earns its place in the financial system, or mobile operators offer more industry favorable payments deals (e.g. a 3% cut as opposed to 30 or 50%), micropayments become trivial. It is a very clever system but it does require someone of Google’s scale to pull it off. After all, their market dominance allows them to reroute dollars for a critical mass of ads rendered on content sites, and a such make it appealing to consumers. Eyeo (the company behind AdblockPlus) could do similar or go freemium e.g. the first 1,000 ads blocked, and then charge consumers (not publishers) to get more. It would definitely go a long way to make amends with the publishing industry and help them shake off the image of extortion. Then again, for every AdblockPlus user feeling alienated, there will be another completely free ad-block solution available. As clever as Google Contributor sounds, I believe that it still falls short because it’s too expensive. If $2 per month removes 10% of ads, then Google and its participating publishers price a 100% ad-block at $20. Assuming the average content publisher generates $5 RPM (i.e. ad revenue per thousand page impressions), then a $20 monthly fee is the equivalent of 4,000 monthly page impressions, or roughly 130 articles per day. The average Internet user, however, only reads about 10 articles per day (as an avid reader, I get to about 40-50). Phrased differently, pricing is off with a factor ten or more. If we further take into account that a ton of remnant / programmatic revenue only yields $1 RPM, the discrepancy is even more pronounced. We have seen similar excessive pricing in other micropayment trials where publisher charge 50c to $1 per article. That implies a $500 to $1000 RPM, which is rather ridiculous since regular ad revenue would be $5 RPM otherwise. Does that mean that publishers are greedy? I don’t think so. When Rockmelt (since then acquired by Yahoo) launched its tablet browser in October 2012, we allowed our users (amongst other things) to enjoy all the content without ads. To enable the experience, we offered our publisher partners roughly $1 per thousand page impressions. They all agreed. And definitely none asked for $500. If a publisher were to ask for 1c per article instead, they would still obtain the equivalent of a $10 RPM. That’s not only higher than what they on average make from ads today, but it would also handsomely play into finding an optimum price elasticity point. After all, assuming the purchase experience is a simple click (or no click from pre-approved sites), 1cent is not something many people would flinch at. In short, rather than greed, publishers are just not ready yet to kill their sacred cow (advertising dollars). Besides, there is no user friendly content payments system and experience available (just yet). A web of paid content is not absolute. A web of paid content is not absolute (i.e. there is, and should, always be free content). Even quality publishers will continue to value incremental distribution if it comes at the opportunity cost of revenue. An example of this is Google’s First-Click-Free program i.e. for paid content to be indexed in Google, it must be accessible for free from a search results page. Micropayments can easily integrate similar concepts in their experience e.g. “First Social Share” or articles discovered through friends are free, etc. In many ways, we can draw a strong comparison with the music industry. Record labels were reluctant to change their business model (i.e. bundling good songs with bad songs in an album and sell the CD) when digital music first came to the scene. Rampant piracy was the externality (in this case: ad blockers) that forced them to listen to their consumers and start selling songs, unbundled, and at a reasonable price point (99 cents) in a compelling experience (iTunes). And leave some for free (e.g. YouTube and Soundcloud) to ensure that the promotion engine doesn’t stall. It took the music industry 15 years to change their business model from selling CDs to selling subscriptions. Today, many people (including myself) much rather pay Spotify $10/month than wasting time on piracy sites. I can’t see it being any different for paid content on the web. Fast forward, we may see content subscription services (e.g. 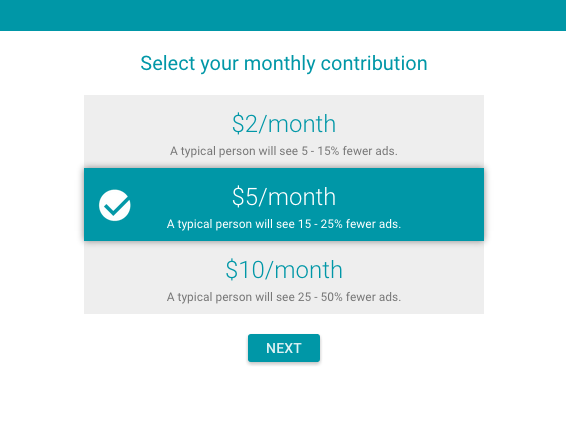 $5/month), without ads, and the implicit promise of privacy. Sign me up. Waiting fifteen years for a new business model to emerge and thrive is too long to sit around. So the theoretical discourse above begs the question what publishers should do meanwhile. Squashing ad-blocked visitors (by denying them access to the content) is not the right solution. We’re still in the early days and it feels eerie similar to record labels flooding Napster with corrupted MP3s or worse, the RIAA suing individual music fans: those “solutions” went nowhere. If you did anything right now, it should be learning about your ad-blocked visitors e.g. who or where are those people? After all, remember that they love you (i.e. they enjoy your content) and don’t run ad blockers to deliberately or hurtfully cheat you out. To kill my own curiosity I built a simple tool to measure ad-blocked visits and report it back into Google Analytics. I’ll gladly share the joy, just email me if you want a copy of it. Once you understand your ad-blocking fans, then perhaps engage and test with business models that suit them (and you!) better.